The 2014 Kickstarters Gascoyne Dash is alive and well and has come to life in the streets of Canarvon, Western Australia. 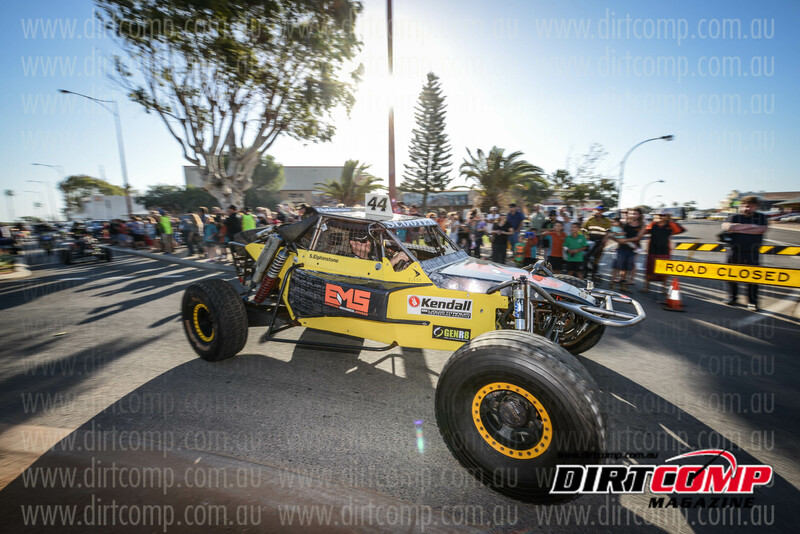 The 11th annual event has drawn in a strong field of competitors in the Auto (CAMS), Moto and Quad (MWA) with the street of the coastal town roaring to life as 56 teams paraded through the CBD. Interstate teams of both auto’s and moto’s have trekked up the WA coastline to line up for scrutiny and prepare themselves for three days of limit testing endurance racing. The local weather has turned on a spectacular week, with temperatures forecast in the low 30’s – a far contrast to the 2013 50+ degree days. Leading the charge for the teams is last years winner Shane Elphinstone in the #44 Holeshot buggy, he’ll be driving hard this weekend to not only back up his 2013 victory but also keep fellow Pro buggy teams Brett Renton #74, Brad Cooper #968 and Rex West in the #967 Razorback at bay as they all try and take the checkered flag on Sunday afternoon. Although the 2014 format will mimic the 2013 event wherein the Sunday’s racing is a loop around the Coonatha complex instead of traversing the Gascoyne river back towards the coast; the title of “King of the River” is still alive and well. For the two years the King has been a victor of the two wheeled variety, seeing Ben Grabham take the honour in 2013 and Rod Faggoter in 2012. With both riders not rolling up the 2014 start line, will 2014 be the year that a Pro buggy or Extreme 4WD team take the title? Dave McShane is one such Extreme 4WD contender that stands a chance at an overall win this year, his recent victory at the Australian Safari a testament to the fact that his Motorite Revo 4WD is on song and ready to decimate the Western Australian desert twice in almost as many months. The scrutineering is now done and dusted for the event and teams are either resting up or spinning some last minute spanners in preparation for Friday’s Prologue. The Canarvon based Prologue is a favoured time for the teams as well as the spectators – the 20km loop winds it’s way around the local hose racing track and golf course in front of packed grandstands. The track is fast but technical with the infield of the horse track comprised of on-camber corners and flowing jumps. The outfield’s then provide fast open stretches, jumps to huck off as well as sandy sections to test teams and riders power and agility. Once we have seen the action on the Prologue, everyone will pack up and head upstream a few hours to the Gascoyne Junction hub and the main race loop that winds it’s way between the foothills of the Kennedy Ranges and the sandy base of the dry riverbeds. This loop will see two days of action, each being comprised per close to 200kms of track. Expect teams to be taking around two hours to complete each day’s lap, with Sunday’s lap featuring a silty and power-sapping 55km stretch of dry riverbed action.